There is no right answer, or all wrong answers. Error Message: "Session Did Not Close Properly"
The diagnostic test is not working. Drag and drop (matching) questions are not working. If you are working on your school's custom EdReady site, they may have set up a private Goal that requires a Key. The goal key is like a password to access the Goal. The key could be anything -- a word or a phrase or some numbers -- that your school set up to allow access to that Goal to only certain students. 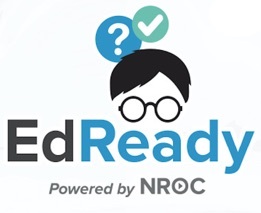 The person who told you to use EdReady should also have given you a key for the Goal you are supposed to access. If you were not given a key, you should return to the person or department that told you to use EdReady, and ask for the key. If they don't know it, tell them to ask the "EdReady Administrator" at your school. If you were given a key, but it's not working, please check to be sure you are entering it correctly. Keys are case sensitive, and spaces count. So make sure you are including capital letters and spaces -- and make sure you didn't accidentally paste in some spaces at the beginning or end, that you can't see. If it still doesn't work, go back to the person who gave it to you, and ask them to be sure it's correct. We at EdReady do not give out goal keys to students. We also do not create or manage them. Only your school can do that, for security reasons. But if you need help figuring out who to talk to, you can get in touch with us and we will be happy to assist.